Research shows skin color was determined by natural selection in East Asia after human populations split from Europeans around 40,000 years ago, then carried over to America by ancient migrations of Native Americans. UNIVERSITY COLLEGE LONDON—Skin color is one of the most visible and variable traits among humans and scientists have always been curious about how this variation evolved. Now, a study* of diverse Latin American populations led by UCL geneticists has identified new genetic variations associated with skin color. The study, published in the journal Nature Communications, found that the variation of light skin among Eurasian people evolved independently from different genetic backgrounds. The genetic study analyzed pigmentation in over 6,000 Latin Americans, who have a mix of Native American, European and African ancestry. It is well established that Native Americans are genetically closely related to East Asians, the initial settlement of the Americas occurring some 15-20,000 years ago, through migration from Eastern Siberia into North America. As a consequence, genetic variations in Native Americans are often shared with East Asians. This study identifies five new associated regions involving skin, eye and hair color. 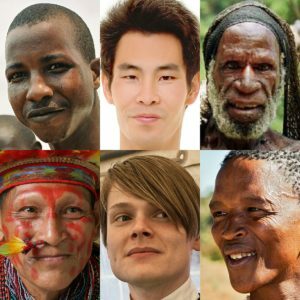 Genes affecting skin color in Europeans have been extensively studied, but here researchers identified an important variation in the gene MFSD12 seen uniquely in East Asians and Native Americans. They show it was under natural selection in East Asians after they split from Europeans around 40,000 years ago, and was then carried over to America by ancient migrations of Native Americans. It is the first time this gene has been linked to skin color in Native Americans and East Asians. Human physical diversity has fascinated biologists for centuries and despite the discovery of hundreds of genes related to such variation, there is still a lot to be understood in order to gain a fuller picture. Scientists have been calling for more diversity in genetics research to ensure that everyone benefits from the medical outcomes of research. Only recently scientists published the first major study on the genes linked to skin tone diversity in Africa. Latin Americans are similarly underrepresented in genetics research, in particular in pigmentation research. “It is commonly thought that variation in pigmentation, such as skin color, in Latin Americans primarily arises due to people’s varying degree of European or African ancestry. But our new study shows that there is variation inherited from their Native ancestors as well”, said Dr Javier Mendoza-Revilla (UCL Genetics Institute). “Interestingly, this gene also turned up in the skin color study in Africans, but the variants were entirely different than those we observe in our study, highlighting the huge genetic diversity in humans and the need to diversify our study populations”, emphasized Professor Andres Ruiz-Linares (UCL Genetics Institute), who led the CANDELA project spanning participants from five countries: Brazil, Colombia, Chile, Mexico and Peru. In addition to skin tone variation, the scientists also noted a wide variation in eye color among Latin Americans. “Just like skin color, early research on eye color was Europe-centric, and mostly focused on the distinction between blue vs. brown eyes. But we show that eye color is a broad continuum, and by studying the subtler variation within brown to black, we found two new genes linked to it”, said Dr Anood Sohail (University of Cambridge). The study’s findings help explain the variation of skin, hair and eye color of Latin Americans, shed light on human evolution, and inform an understanding of the genetic risk factors for conditions such as skin cancer. See, first-hand, the original fossils. See original artifacts. See the actual sites. Talk with the famous scientists. Join us on this unique specialized study tour.